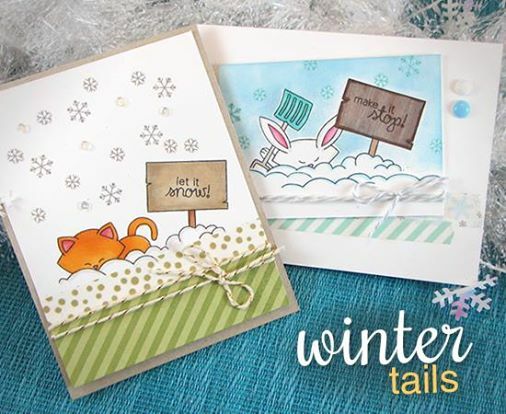 Today is reveal day two for our Holiday Release and we are featuring the set Winter Tails! This stamp set was inspired by the loooooong winter that we had in Wisconsin last year! I thought it would be fun to be able to share your love (or hate) of snow with these fun snowy friends! Do you have lots of snow where you live? note: all the sentiments fit inside the sign so you can create a custom message! What do you think of this set? Do you get too much snow or not enough where you live? Here's what our Team created with these Snowy Friends! Check out all the amazing projects below from our Design Team and Guest Designer, Donna Mikasa! Then, make sure to click through to all their blogs for details on their cards - Some of the designers have extra cards on the blogs and you might even find a fun video or two along the way! Make sure to comment for a chance to win! Details on the giveaway are at the bottom of today's post. 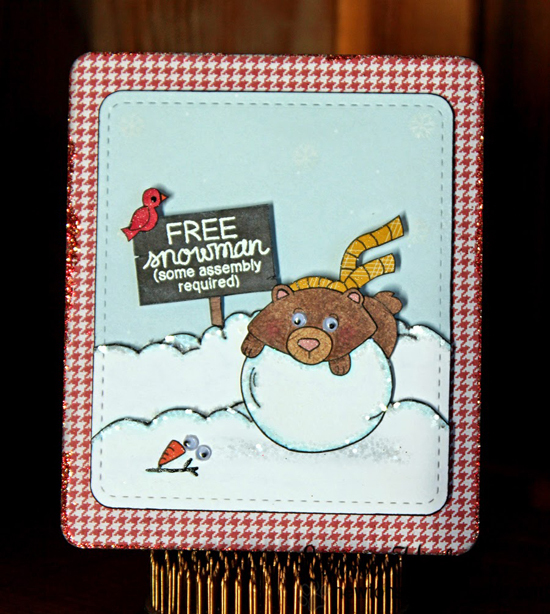 Guest Designer Donna Mikasa created this adorable mini card with Winston on the big snowball! 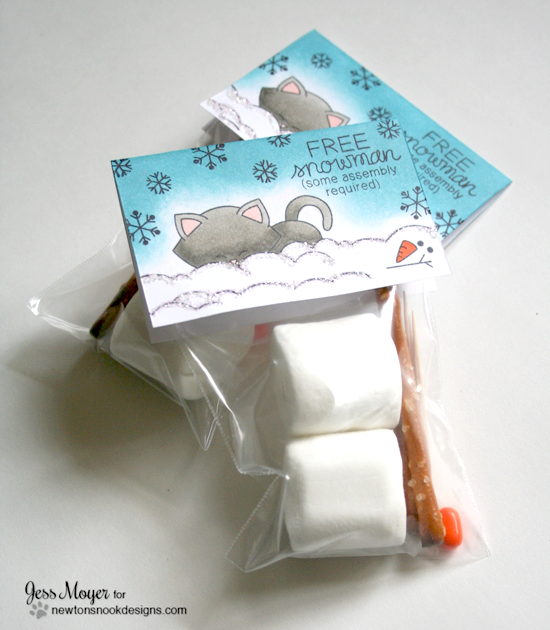 Jess created this adorable little "snowman kit" with a fun topper - such a cute idea! Samantha created this cutie with the bunny up to his nose in snow!! 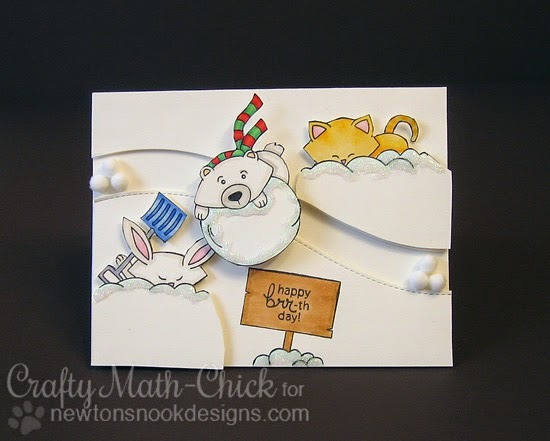 This fun slider card is by Crafty Math-Chick - Love all the critters playing outside together! 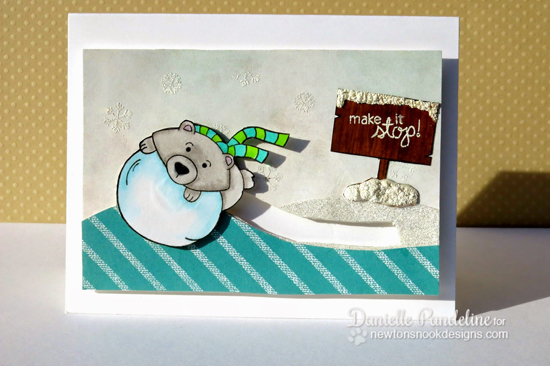 Danielle created this fun spinner card - Love the fun snow on the sign too! Here is a cute card by Shellye! I love the fun pattern papers as snow! 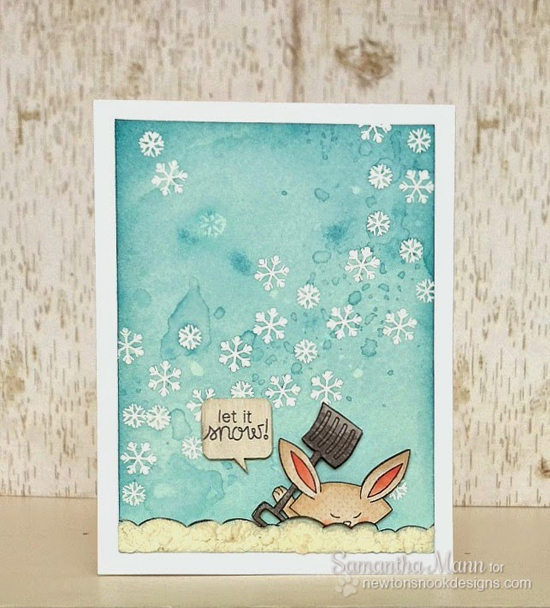 I love the glittery snow on this cute bunny card by Stephanie! 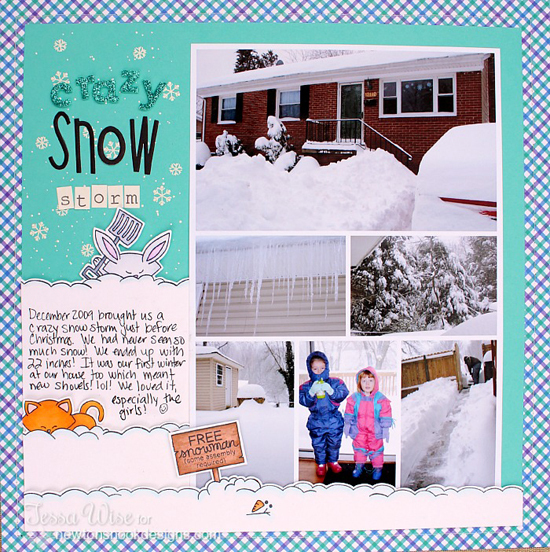 Tessa created this super fun scrapbook page - what a great way to remember a snowy day! Taheerah created this cute slider card with Winston! It has such a pretty sky too! This cutie by Larissa features Winston - do you think he's trying to make a snowman? 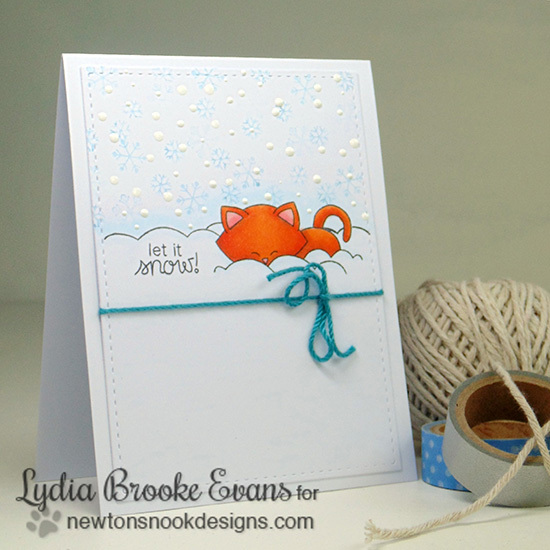 This adorable card by Lydia features our cute kitty - trudging through the snow to say hello! Would you like to win “Winter Tails”? Comment on the NND blog and Design Team and Guest blogs (see list below)! Two winners will be chosen at random from the collective blogs release posts. Make sure to check out each of their blogs and comment for your chance to win. You will not know which blog has been chosen so the more you comment on the better your chances are of winning! You have until Tuesday, November 11th at 9pm CDT to comment -- winners will be announced on the blog post on Wednesday, November 12th. What an adorable new stamp set. I just love it. Beautiful projects to showcase this. Love the animals and the showel.So many great ideas on how to use this set. Love it. I love the sentiments "Make it stop" and "Free snowman (some assembly required)". They are so unique and go well with the adorable animals! Love this stamp set. Being geared to winter it will be useful for a long time. The DT did an excellent job of highlighting the set - especially with the spinner cards. Another adorable release! I live in Minnesota and can share the love/hate relationship with snow! Would love to win this stamp set! I LOVE IT when we do! What a cute set! I love the two options.. I live in Southern California, so I'm all for the snow! Everyone's creations are adorable, loving all of the fun slider cards! WOW ladies! We knocked it out of the park!!! What a great selection of cards! I love the cute stamp set - especially the signpost with the alternate sentiments! Just awesome adorable winter theme! Cute, cute, cute! I love this set! What great images and I love the sentiments! The DT samples look so adorable - I'm off to hop now! Oh my gosh!! I LOVE this stamp set!! The sentiments are awesome!! I needed the 'make it stop' sentiment last year!! what an awesome release!!! LOOOOOOOOOOOVE this set!! and jennifer, your cards are AMAZING!! 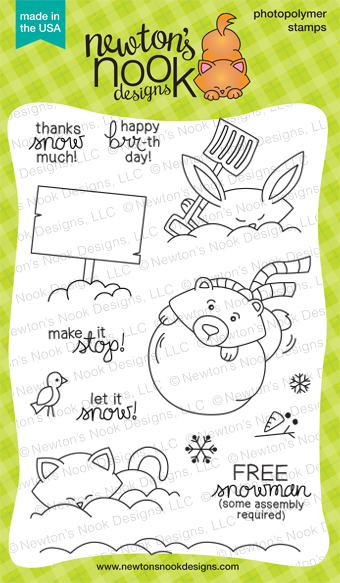 i LOVE the light grey snowflakes with newton, and the washi one the bunny card is AWESOME! i love the angles!! that card totally inspired me...i have a whole NEW idea for this set!! :) thanks, jennifer! Another adorable stamp set!! I live in coastal Virginia so we don't get a lot of snow. Maybe one or two dustings and one big (to us!) snowfall. Funny part about it is that everything shuts down when we get an inch!!! LOL Happy Stamping! love the new set! these cards are precious!! So cute! Love all these fun projects to show off that sweet new set! Your cards are adorable--and so is this set! Aw! So cute! Great job with this set, DT!! Love this stamp set! If I don't win it, I will definitely putting this on my wishlist. EEk! Yet another wonderful set! Great inspiration!! How cute is this stamp set! I lived in Iowa for six winters, so I get the shovel! So funny. Love Newton's Nook! Very fun set esp with the winter we had last year. Brings back a lot of childhood Canadian memories. What an absolutely cute release. Love the snow stamps, they are so playful. Oh, my- what cute designs.... Love those slider cards and the colors on all the cards! Super cute and playful designs, great release! What an explosion of fun, the stamp images and all the projects!!! Love this new stamp set and all the designer's creative cards showcasing it. What cute projects with this set. These are ADORABLE!!! Thanks for sharing. Absolute adorable-ness! The DT have showcased these wintry delights fabulously!